Car Wax, Glaze or Paint Sealant. What Paint Protection is Best? A lot of people like to wax their car to give it a nice shine. With clear coat on new cars, Sunday afternoon car waxing may not be necessary. Let’s take a look at the differences between Wax, Glaze and Paint Sealant. WAX – Waxes are liquids or pastes that contain natural carnauba wax as the main ingredient. They usually create a wetter, glossier look to the shine and are usually easier to apply than paint sealants due to their greater oil content. The downside to using wax is the protection won’t last nearly as long. Car waxes usually provide protection for 1-3 months. The other downside is the wax will dull over time and will always need to be reapplied. Waxes can also lead to a dull build-up. GLAZE – Glazes are oil-rich liquids designed to temporarily fill and hide fine scratches and swirls in a vehicle’s paint surface. Most detailing shops will use a glaze after using rubbing compound to hide the uneven surface they have created after applying compound to a car’s surface. A glaze has the shortest longevity of protection, lasting a week or two at most. A simple rain shower will remove most glazes. At the same time though, glazes can offer extra shine and gloss to a properly prepped and polished automobile paint surface. PAINT SEALANT – Paint Sealant is a Teflon based product which is buffed onto the entire painted vehicle surface. It offers protection against tree sap, bugs, sun fading, acid rain, bird droppings, leaves, etc. for up to 10 years. If you want to apply something frequently to “baby” your baby, we would recommend using a glaze as it won’t lead to build-up or any haziness over time. 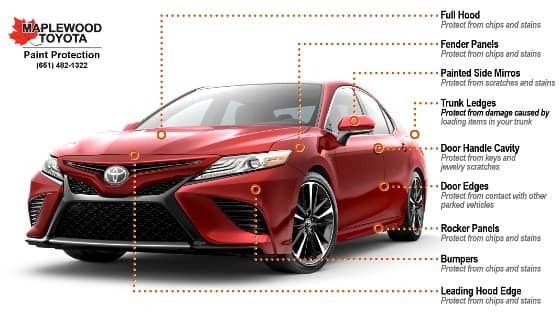 If you want to be one and done, have Maplewood Toyota Service apply the Teflon-based Paint Protection Sealant and you won’t have to worry about it anymore. 0 comment(s) so far on Car Wax, Glaze or Paint Sealant. What Paint Protection is Best?